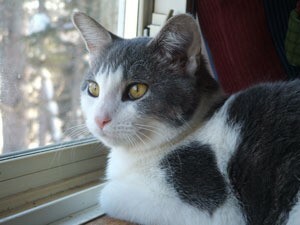 Dolce is a 1 year old Domestic Shorthair. She was a rescue kitty from the local Humane Society, 2 months ago. She likes to eat, eat, eat! She is not as playful as our other kitty, but she is so cuddly and sweet. We all love her. She is a fabulous addition to our growing family. 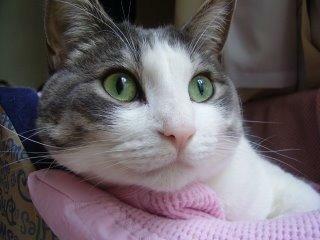 She is a beautiful cat. Looking at the picture it makes a person question what is Doyce thinking? She sure is a pretty girl - and a lucky one, too! I know she has made a wonderful companion for you and your family. Thanks for sharing Dolce with us and God bless you. Dolce is beautiful! I'm a kitty person and have a cat named Rasta (my Thrifty Fun site name) He is a healthy 16 year old. Still goes tearing through the house for his daily exercise. He is very lovey as well. Have lots of fun with Dolce. Whoa! Your Dolce is the long-lost twin of my Bingo! It's amazing how similar they look. Thanks for sharing your picture.